The big bulge is the shape formed by three stones with a keima-keima-ogeima relationship, as shown here. It's a good shape because it's flexible, but also very well connected. However, it has a weakness when it comes to eyeshape. It looks like a rotated and stretched bulge. With one stone added, it becomes the throwing star shape. This term is coined in Charles Matthews' book Shape Up!. This shape is also known as boomerang shape. 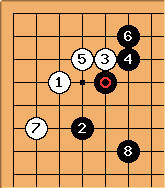 This shape also occurs in Yu-Ch'ang-hyeok-Yi Se-tol (B) played 2000-12-20. This game (but not the particular move) is commented in Go-World #91 pp. 33-39. A common joseki that involves this big bulge shape is a 4-4 point one space low pincer invasion block joseki. The shape is formed by - - . Another joseki that involves this shape comes from the 4-5 point 4-3 approach keima joseki. It looks like this, with - - forming the shape. Uberdude This shape does have a weakness, that I will forever remember as my teacher Willzhang, a chinese 6 dan, exploited it brilliantly. I forget the exact position, but I had some floating stones in the middle dominated by my opponent's thickness that were trying to make eyes. I played the big bulge shape, and he played at the shape point below which took away all my eyes. In the end I died. In the review he said I should have played the slower but more secure SakeBottleShape.